The Indian Summer conditions are not unusual for November but they do provide great riding conditions . Unfortunately the little rain that has fallen so far has not created sand-free trails but David did come up with a relatively sand- free ride. I will not bother you with the details of where we rode because if you were there you know the route and if you were not, why bother to find out. Its history. But we did reach Udim and we did have breakfast and we did over 30 kls. And we did have 23 riders and we did have a good time. I forgot to mention we had several falls and the med kids did come out to provide first-aid. My point is... Always keep a first aid kit in your bags as you never know when they will be needed and keep the contents up to date as some of these items age quickly. They say, you can't explain Jerusalem to people who've never visited. The same applies to our moonlit ride, in the desert, last night. 12 "insane" cyclists drove about 175 km to get to the start point for 5:30pm. After a meticulous briefing by Avi (you don’t want to get lost in the desert at night! ), we set off. 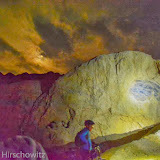 For at least 50% of the ride, we rode with no lights, trusting the full moon to show us the way and protect us from harm. There was something magical and mystical about the whole experience. Now and again, between the "bursts" of adrenalin driven (often female) voices (no names), we heard the desert silence. To recalibrate our ear-drums, a few fighter jets flew just over our helmets, increasing the adrenalin, and predictably, the volume of the voices; in turn, re-confirming the 80/20 rule. (Work it out). Cycling up a dry river bed, across a plain covered in powder that I'm still digesting, and winding down a long, cliff clad, dry river bed at the other end. A healthy "clear the moon dust out of your lungs" sprint got us back to the cars for 10:15pm; plenty of time for a quick Red Bull in anticipation of the 175km homeward journey. Thanks to Megan Cohen Kaddouch for dreaming up this ride, to Avi for organising it so well, and to Michal Cahn and Ilan Hirschowitz for taking professional cameras with, to challenge the dark; and in some cases, as you'll see, turning night into day! 7.30am saw 20 riders gather at our usual Home Patch starting point ready for another fun outing.....except for Michal....she didn't read her notice and was there 30 minutes early!!!! Moral of the story....Bulletins and notices on our website are there for a purpose....TO BE READ! Anyway, off we went in the direction of Batzra and at the Batzra T-Junction we turned East towards Highway 4, went under the the Highway via the pedestrian subway and proceeded East in what I think were the fields of Sde Warburg. Then the fun (did I say fun????) started. We hit the sand!! A few of us had done this ride last week after a wee bit of rain and then, the ground was firmer and the sand wasn't too much of a problem, but this Saturday.....whew!!! We all did a fair bit of walking! 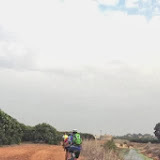 We pushed on, sometimes on the bike, sometimes on foot, through the fields of Kibbutz Mishmeret, throught the Kibbutz itself and then on to the new Highway not yet in use, I have never been so pleased to get onto a hard road We cycled as far a Tsomet Dror. Then it was South along Highway 4. Soon after we passed the Sharon Prison we headed East towards Yaqum up until the railway line going off road as we approached the line. Then it was South as we made our way to Central cafe at the Ra'anana Lake..........another 30 odd kilometres under our belt and a great time had by all (despite the sand)! 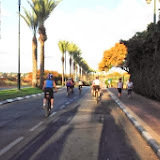 There is cycling life for those who chose not to zoom around the Kinneret... 11 of us set off in perfect cycling weather to enjoy a 31km ride on a partially new route! Ilan started us off and Merrill took over and we pedalled along paths new to almost all of us. We headed north through Bene Tsion where we crossed Route 4 in a graffiti-enhanced tunnel to the east side of the road. We then headed east up to Sde Warburg, north to Tsommet Dror area where we crossed back again on the newly finished road (not open to traffic yet) and headed south past the prison. Unfortunately, John wasn't able to set the Hasharon prison alarm off (we managed to restrain him) and we headed back to Raanana to refuel. And what a lovely surprise! Uri invited us to his house where we sat in the garden and his wife Eti (with very little warning) produced a feast. It was lovely to sit in his quiet garden and enjoy his and Eti's company. Merrill and I stayed a bit longer and were lucky to get to taste the delicious cake that Eti whipped up for us. Thank you Uri and Eti, and mazal tov for your birthday last week, Uri! This morning I was one of seventeen riders who decided to ignore the weather forecast and face the elements. 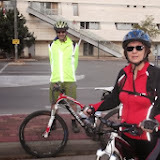 We set out westward along Ahuza Street and turned into the fields opposite Ra'anana Park. We continued along the route carved out in preparation for Road 531, through Moshav Rishpon, across the Coastal Road footbridge, and over the railway line. We then headed north, passing fields in which enormous pumpkins were preparing for Halloween. There was some discussion about how we could take one with us - balance it on the handle-bars or magic it into a carriage perhaps - but luckily nobody gave it a try. We continued through the Sculpture Park and into Kibbutz Shfayim, which boasts separate human and canine guest houses and a water park where all guests meet up (after a hearty breakfast). Leaving Shfayim, we gingerly opened the gate leading into the Sharon Nature Reserve, and tiptyred through (tiptyring is tiptoeing on wheels). This was because, as John warned us, straying from the marked route within the reserve could land us a fine. Luckily the warden and his dog were breakfasting at Shfayim, and we anyway adhered to the designated path, and so passed through without incident. We continued north towards Kibbutz Ga'ash, the Mediterranean ever glimmering to our left. At Ga'ash we circled a soggy golf course, and just as I was thinking about how it had luckily not started raining again, it did. 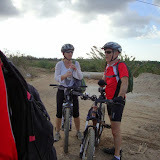 There were actually two downpours in the course of the ride, and so Barbara asked if we were entitled to a discount. David told us not to worry - the price would be watered down accordingly. As it so happens, the rest of us were "watered down" too, but dried quickly and were not particularly inconvenienced by it. There are actually distinct advantages to riding in the rain. Firstly it keeps you wonderfully cool. Secondly, the footpath over the Coastal Road - that also serves a horse population - has never looked so clean. The disadvantage of rain is of course the mud, which sticks to your wheels and hurls itself in all directions as you ride, sometimes ending up inside your clothes. There were several sandy patches too, which presented the usual challenges. After an especially tricky one, we announced that we finally saw the light at the tunnel, to which David responded that he could not see a tunnel. But, as Barbara explained, you cannot see a tunnel while you are inside it. After Ga'ash we crossed back over the Coastal Road, and headed East. 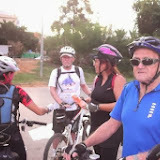 We stopped outside Café Bueno for a few minutes, greeting Avi and Nirit whom we met there, and then it was onto Kibbutz Yakum. We rode along one of my favorite singles, which led us down a rocky descent and along a ledge over the Poleg River. We continued through a patch of exotic bamboo trees (with branches that unfortunately seemed intent on attacking us), and then south towards the Europark complex. From Europark we cycled through orchards to the railway line. We continued south along the railway line, over the level crossing, and through more fields and orchards until we reached the coffee shop at Ra'anana Park. There David guided a few lost riders back to the fold by phone, and we all enjoyed a well-earned snack. To summarize, it was an exhilarating 29-kilometer ride against a dramatic landscape of dark clouds, quiet villages, and lush nature. At 7.30 on a fine autumn morning, we assembled just east of the Beit Lid junction and awaited David - Our Fearless and Illustrious Leader. 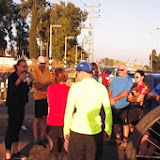 The Cyclenix Motorcade then set off and after a short while entered the gates of Moshav Burgata. Shortly after parking next to the miniscule shopping center, all 17 riders were ready and raring to go. The morning was autumnal fine with just a little nip in the air (no connection to the pre-Pearl Harbour weather forecast!) and promised a fine sunny day. 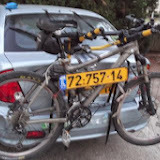 The asphalt road of the moshav soon gave way to a gravel path and the Cyclenix Flying Column was on its way! There is nothing like a good cycle ride to clear away the cobwebs and disperse all the week's worries and very quickly the route and the good company did the trick. From the moshav the gravel road ran along the river bank and we occasionally alternated sides via bridges and a causeway. The river being stagnant after the dry summer was mostly covered in a carpet of green algae which made a pleasant contrast to the brown of the open fields. Bushes and bamboo hedges soon gave way to fields of cotton, dry and empty after being picked. After going under a few motorway bridges, we entered the Nahal Alexander Park, went down and up a grassy slope and continued along the concrete path to the wooden bridge and vantage point where it is possible to see the renowned turtle population. I personally feel much admiration for these creatures who manage to survive in the rather murky and unpleasant looking waters. At least on Saturday, their tedium is broken by being able to gaze upon all the humans gawping at them! Our intrepid band did not tarry, avoided the temptations of buying ice creams at the overpriced refreshment vans stationed there and pressed on towards the strand. After a short while, we came to the beach, managed to cycle across the moist sand and sat down for a well-deserved break near the water to enjoy the sea air, admire the view and to munch all our goodies that had been brought from home. Adventurous Ingrid and Undaunted Michal, not being stick in the muds like the rest of us, went for a dip in the sea, Ingrid emerging from the water like Botticelli's Venus arising from the foam. All too soon the break was over and we wended our way homewards. On the way back, as is the custom, we imbibed a bit of culture, pushing our bikes up a steep hill to admire the ruins of an old custom house. The park itself was now quite full with mainly young couples picnicking or strolling and it was great to see lots of small children taking their first steps in the world of two wheels: on push bikes or riding with trainer wheels. All too soon, we left the park and returned on the same route. It now being well past 11 o'clock, it started to become quite hot. With a stop or two to rest, to let the slower ones catch up and to fix a puncture we returned to the car park at noon. Most went home and some of the more sociable souls congregated at a nearby café for the post ride cup of coffee. The ride was quintessential Cyclenix: good company, the joy of riding a bike, a pleasant route, consideration for others and good route planning and leadership. May there be many more for us all! Yes, twenty of us gathered to set off on our familiar route, enjoying the cloud cover and slightly cooler weather. We covered a good 33 km led by David who is fresh back from cycling with Gabi and co. along the mighty Danube. Yochi joined us after a long absence - we hope that Anna will convince you to come more often...Megan was sporting a natty plait - maybe the fashion will catch on with others in the group with longer hair! Agam offered a welcome refreshment stop - a lovely ride and, as always, in good company. Only Ten of us showed up at 7 at the Ayalon mall, the poor turnout could only be attributed to the over indulgence at the many holiday meals, like the mantra goes "they tried to kill us in the holy - days, let's eat!" The first (of two) eventful incidents happened after 30 minutes of Michal snapping away with her Canon SLR. "Oops" she said "I do not have a memory card" so the pulitzer prize winning shots were forever lost to human kind. I could not help but remark that if she was using a Nikon this would not have happened. Since being ten years old, I have not had as much practice dodging people, bikes, prams, runners, walkers, most of whom have no idea that in Israel we drive on the right hand side of the road. We crossed over the border to Bat Yam , a paradise for the Israeli national sport of "matkot" and stopped to breathe in the sea air. On the way back through Jaffa we stopped at a nice coffee shop near the clock tower for breakfast. Heading back on the "bike only path" the second incident happened where a kid with no road sense riding on the wrong side of the path and crisscrossing over, hit Yvette. Luckily Yvette was okay and sustained only a bruised finger. For us having just returned from the UK this was a "welcome back to Israel" ride. At 7am 12 riders met at our usual starting point. The skies were slightly overcast, and it was not too hot... in fact almost perfect weather for biking. Our numbers were slightly depleted as a few of our regulars were cycling along the Danube on what has now become an annual excursion organized by Gaby. As we were about to start I received greetings for us all from David and Ingride (two of our absent members) from the banks of the Danube. Thank you and we all hope that you're having a great time. As David (our usual pathfinder, was away Ted planned the route and while the cat was away he made a few subtle changes!!! It was great to have Avi Tsabban back with us after his recent foot surgery and Nirit. Hope to see the TWO of you regularly in the future. What was very noticeable ( and has been for some time) is the progress being made on the highway being built in our area. Progress in one field amounts to regression in another. Many pardessim (orchards ) and agricultural fields have disappeared. L I suppose that that's the price one has to pay to progress, but nevertheless for us off-road bikers is sad to see some of our regular routes no longer exist. 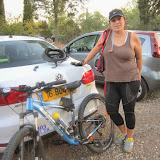 The route itself was not all that different from our usual Ra'anana, Batzra, Bene Tzion, Udim, Yaqum, Rishpon route and eventually we made it to Central Café without any mishaps and not one puncture. That's a good way to start the year!!!! Total distance covered 26 kms.